State-of-the-art technology, advanced training, and compassionate service. With a stream of options available today, Dr. Latham incorporates the most modern technologies proven to deliver a higher level of care to his patients. This means comfortable procedures and predictable results. With this winning formula, you'll find that our dental care is different...and better than ever. Computer aided design (CAD) involves the design and creation of three-dimensional models for restorations and appliances such as veneers, onlays, inlays, crowns, and bridges with absolute precision. CEREC - Single visit tooth replacement! CEREC is an advanced dental restorative system that allows Dr. Latham to restore decayed teeth, place crowns, remove defective or unsightly fillings, or place cosmetic veneers in just ONE appointment! Lasers are a safe and gentle alternative to traditional dental tools. Using a laser, Dr. Latham can perform many procedures that normally would require anesthesia and a dental drill. Laser Dentistry has many benefits for dental procedures due to its versatility. For example, lasers can be used for both bone and soft tissue procedures. From removal of decay to root canals and even smile design, lasers reduces any possible discomfort that is associated with older technology and it vastly reduces your recovery time. Dr. Latham is able to remove tooth decay, bone and soft tissue precisely while leaving surrounding areas unaffected. This conserves more of your natural tooth structure, helping you to maintain and preserve the teeth you were born with. Digital X Rays use special sensors instead of photographic film. Time Savings - bypassing the need for traditional film processing time lessens the time you spend in the dental chair. Intraoral Imaging offers you a unique view of your mouth allowing Dr. Latham to educate you while directly involving you in your treatment plan. 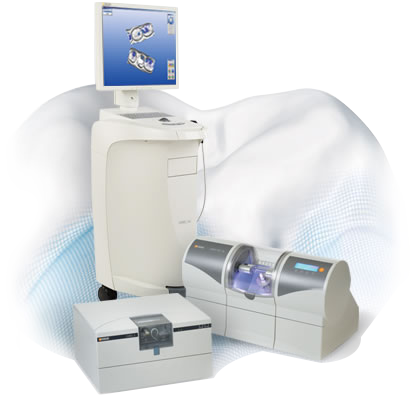 Transferring magnified intraoral images to a computer screen allows you to see your own intraoral conditions with better quality than a traditional mouth mirror. This clarity allows both you and Dr. Latham to visualize the diagnosis and to cooperatively discuss your treatment needs. Dr. Latham utilizes advanced imaging techniques to create three-dimensional surgical guides for your dental implants. Not only does three-dimensional technology offer pinpoint accuracy for implant placement, it also greatly reduces radiation exposure. Three-dimensional imaging is also useful for diagnosis of sinus issues and other pathology.